The less time you spend in a place, the easier it is to sum it up with confidence in a few lines. 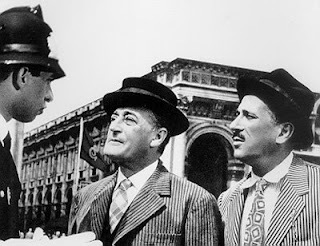 Milan in my head starts with this and this, both from Totò Peppino e la malafemmina my all-time favourite Totò film. Add to those two clips the arbitrary judgements of friends and acquaintances, throwaway one-liners, and you get a general sense of 'German', 'grey, cold and foggy', 'industrial and not very green' 'modern', 'full of models'. Which all turned out to be true except for the foggy bit, we are, after all, in the middle of a heatwave. German, or Austrian, not in a strudel und sahne sense, but that everything and everyone works, and seem to allow others the same priviledge without a lot of unnecessary confusion. Not very green, definitely, but not in an ugly way,... anyway I am getting ahead of myself. They go on a lot here about how ancient Milan is, a Roman and even pre-Roman city, for a time the capital of the Empire (a pretty short period of time, but still..) and then how this a place where 'one breathes Paris'... perhaps Milan is the sidekick, the co-star, the passive aggressive sibling of Rome, a city with absolutely no problem in being its schizo-uncoordinated, messy and prodigal, self-centred self. Milan is built to work, to resolve issues, to move on: Rome is built to be visited, to be problematical, that's Rome's thing, to be admired, hated, never ignored. One has the sense that Milan is the 'sensible one' still waiting to be recognized as such. But what do I know. The main things to be seen here, from my point of view, are a few Lombard, a lot of gothic and romanesque architecture; the renaissance castle, via Montenapoleone in the heart of the fashion district, the Last Supper, some art galleries, and the cathedral of course. The Pirelli building, and 60's architecture by the yard, not really my thing, but who knows. Milan is 11 minutes from Monza, by train, a train filled with ugly girls who spent the entire journey exchanging stories about how they had been mistaken for 'much younger women'... I think the prize for lames story was the 20 year old girl whose neighbour had guessed her age as 18. I think there is a special hell for eavesdroppers, and it consists in being exposed, powerless, to the inane conversation of people under 25, who share at the top of their lungs the news of how they've discovered gravity and reinvented the wheel. Still they could have been talking about World Issues, so I consider myself as having been let off lightly. The Brera was at the top of my list of places to go, also the orto botanico which is part of the same complex. I'm particularly interested in gardens and botianical ones most of all. Milan city centre is a very simple piece of topography, you just go to the most findable monument first, and that, of course, is the Duomo, visible from a large percentage of the city. Add that to the fact that everything is clearly marked, you can't really get lost. There's only a handful of metro lines, and they seem pretty idiot-proof, and on the platform, there's a nice big TV screen with news, although, this being Berluska's stamping ground, I wondered if it was a Foxy channel, ie skewed news for the masses, a sort brainwash-while-you-wait arrangement. There was no time to make a judgement, the train arrived in businesslike manner, and four stops later I was at Piazza del Duomo. This is the big brother of Monza's duomo, also built in the 14th and 15th centuries, also but even more in International Gothic style. From far away you can see it has about a million statues on the pinkish grey marble front, almost a cross between a pup tent and a confectioner's nightmare, with pinnacles. Not to mention the madunina... and in another post there'll be space to put more pictures. If you enjoy the overly exuberant cathedral facade you'll love their website it is an exact etherial match. Heat, like odour, works in a very specific part of the memory. The heat of the day is often the first thing you forget, you remember being uncomfortable, or the inconveniences of the hot weather, but the sun on your skin, that is only properly recalled the next time you find yourself in the same situation. Not a humid heat, like we get in the South, but as intense as a hairdryer. There was a line coming out of the cathedral at least 300 people long, so I immediately gave up on going inside. The square in front is elegant and airy, despite the rays pressing down on us. For some reason, instead of selling the usual trinkets, the African streetvendors were all giving away some sort of coloured strings to be tied into bracelets. To the left in this picture, the Mother of all Malls - the Galleria. Italians use the word to mean Galley but also Tunnel. Named after Vittorio Emanuele II, the first King of the United Italy (and if you think Vittorio Emanuele is a mouthful, his full name was Vittorio Emanuele Maria Alberto Eugenio Ferdinando Tommaso... the number two though in terms of the Kingdom of Sardinia, which is actually the ruling house of Piemonte, no, this is getting too complicated for this blog... ) It is not, as some think, the 'first' galleria, not even in Milan, there's a much smaller, plainer, earlier one at San Babila. This Galleria, however, was the brainchild of Giuseppe Mengoni and dates from 1865... think Liszt and Yeats, Browning and Verdi and Wagner, the assassination of Lincoln and Rockefeller's first oil refinery. It's not If it makes you think of the Crystal Palace, that's no surprise (unless, of course, you don't know what the Crystal Palace is) - the two are only six years apart. Burlington Arcade in London is the copy-cat version. Ironbridge was also an inspiration, and, in turn, Mengotti's design, linking two of Milan's most fashionable streets under a canopy sufficient to protect elegant shoppers from the worst indignities of Milan's weather, is said to have been one of the places that gave Gustav Eiffel an idea for a tower. The city of Milan, booming in what has come to be known as the second wave of the industrial revolution (trains and all that jazz) set up a competition for an original building to celebrate the city's new wealth and status, Mengoni's design beat an impressive 176 other architectural proposals. The King, for whom pretty much any new construction was being named in Italy at the time, did not come to the inauguration of the Gallery; Mengotti later threw himself off the top of the building, some say out of disappointment at the royal snub. Seems a bit much, to me. The octagon, at the point where the two tunnels cross, was the 'salon' of Milan, where the city's VIPs came to see and be seen. Of course now the VIPs are mostly Varied International Passersby. Four floors contain are all kinds very elegant restaurants and internationally famous shops prestigious offices and some residences tucked in here too, although I wonder how long it takes for the shine to rub off living in a mall, even a historic mall - this is the place to go if you want sunburnt English people to step on your foot, or large families with absolutely no peripheral awareness to walk in front of you ar 0.05 miles an hour. The mosaic of the coat of arms of Turin (the King's city) has a bull on it, and it's considered lucky to put your heel on the bull's family jewels and spin three times. There was a line.